Correspondence to: Correspondence Berna Elya Faculty of Pharmacy, University of Indonesia, Kampus UI Depok,16424 and Center of Study on Natural Products, University of Indonesia, Kampus UI Depok,16424. Phone no: +62 813-1416-1497 E-mail: berna.elya@farmasi.ui.ac.id. Genus Phoebe have been reported to produce isoquinoline alkaloids as aporphines, noraporphines, and benzylisoquinolines. Many of these isolates exhibit diversified biological activities, including cytotoxic activity. The objective of this study is to determine cytotoxic activity of compound isolated from Phoebe declinata againts MCF-7 (breast cancer cell line). 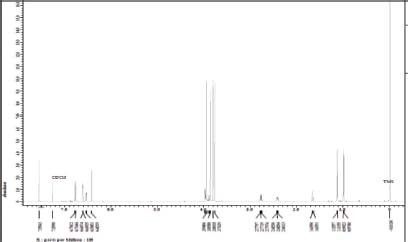 Extraction was done by reflux using n-hexane, antioxidant activity measured by DPPH method and reducing power method, cytotoxic activity measured by MTT assay using MCF-7 cell line, struture eucidation was confirmed by NMR. The antioxidant activity measured using DPPH method for 1 and 2 showed IC50 value of 6.42 and 11.80 μg/mL respectively and using reducing power method for 1 and 2 showed IC50 value of 7.02 and 13.74 μg/mL respectively. 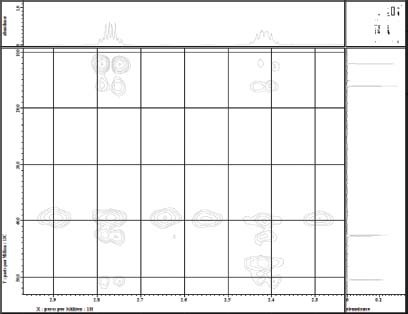 Compound (1) and (2) exhibited cytotoxic activity against MCF-7 cells with an IC50 value of 82.978 and 93.179 μg/mL. 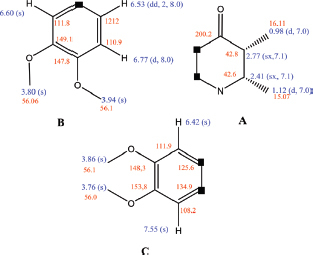 Compound (1) and (2) exhibited antioxidant activity and cytotoxic activity against MCF-7. 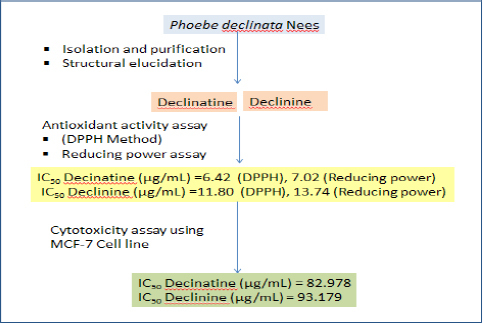 This research was the first study reported new alkaloid, declinatine and declinine, which have been isolated from Phoebe declinata Nees and its cytotoxicity to MCF-7 cell line. Phoebe declinata Nees belongs to Lauraceae family which commonly grows in Indonesia.1 The plant is a multy years plant (perennial) of moderate size (about 30-40 feet). This plant is called in Indonesia as huruhejo or bedagai, and grows commonly at Sumatera and Java.1,2 Genus Phoebe have been reported to produce isoquinoline alkaloids as aporphines, noraporphines, and benzylisoquinolines.3-5 Many of these isolates exhibit diversified biological activities, including antidiabetes, anti-inflammation, cytotoxic, antibacterial, antifungal activities and antioxidant properties.3-6,7 Previous paper, we reported the isolation of alkaloid declinine from stem bark of Phoebe declinata.8 In our present research, a new alkaloid declinatine (1) was obtained from the hexane extract of the plant and a known alkaloid declinine (2) from diclormetana extract (Figure 1). 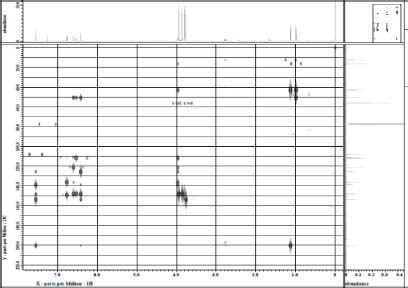 The 1H-NMR and 13C-NMR were recorded in deuterated chloroform on JEOL 500 MHz instrument. Silica gel 60, 70-230 mesh ASTM (Merck 7734) was used for column chromatography, Mayer’s reagent was used for alkaloid screening, TLC aluminum sheets (20 × 20 cm Silica gel 60 F254), were used in the TLC analysis. The TLC spots were visualized under UV light (254 and 366 nm) followed by spraying with Dragenderff’s reagent for an alkaloid detection. 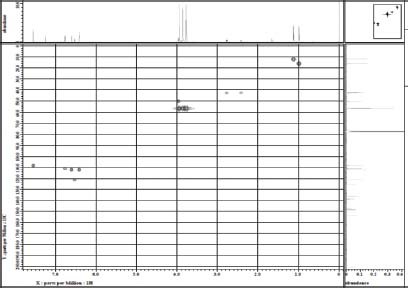 1H-NMR spectrum compound 1 in CDCl3 (Expanded)..
1C-NMR spectrum compound 1 in CDCl3. 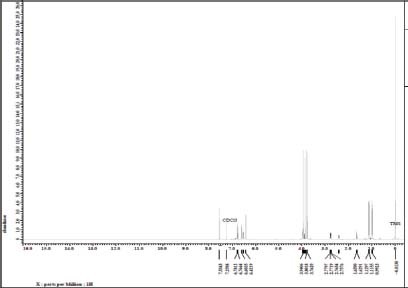 1H-H COSY spectrum compound 1 in CDCl3. 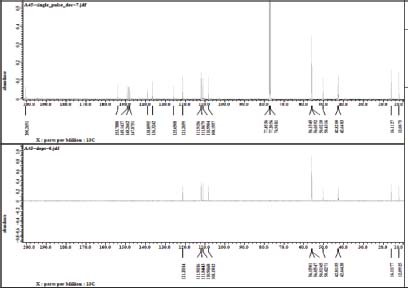 1Data slate spectrum compound 1 in CDCl3. 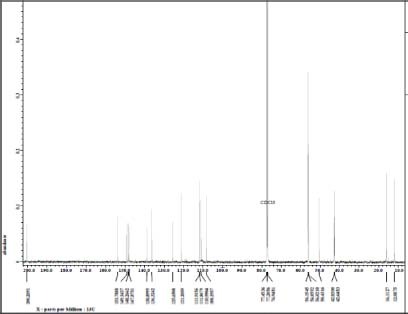 1DEPT spectrum compound 1 in CDCl3. 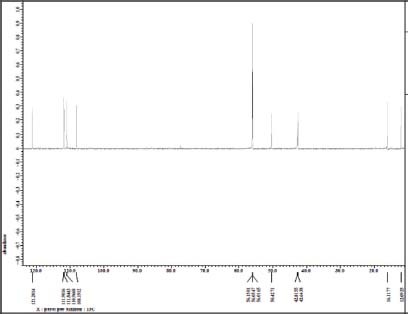 1HMQC spectrum compound 1 in CDCl3. 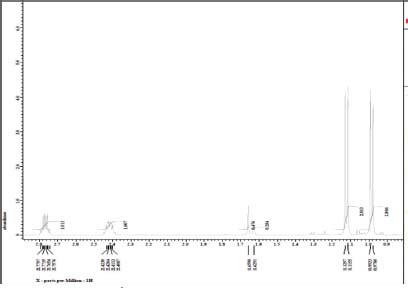 1HMBC spectrum compound 1 in CDCl3. 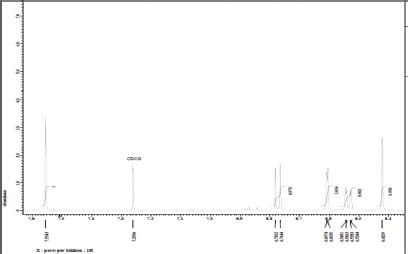 1HMBC spectrum compound 1 in CDCl3 (Expanded). 1Selected HMBC correlation of Compund 1. Compound 1 was obtained as a white crystal. 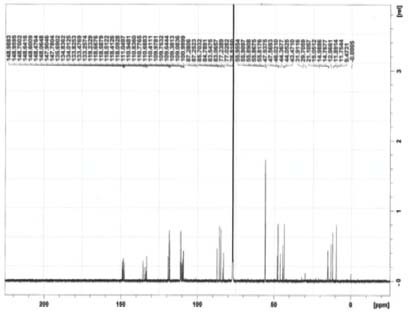 The LCMS-IT-TOF revealed a pseudo molecular ion peak at m/z 372.4417 [M+H]+, thus suggesting a molecular weight and formulae are 371.449 and C22H28O5. (calc. 372.45). 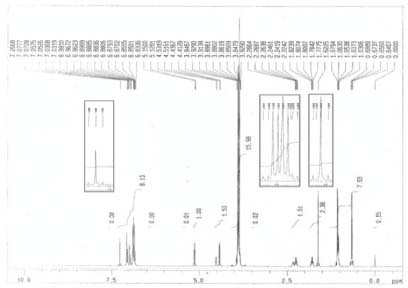 The 1H-NMR spectrum (Figure S1-S5) contained the presence of three protons of phenyl as ABX type (C ring) at at δ 6.60 (H-2', s), 6.77 (H-5', d, 8.0 Hz) and 6.53 (H-6', dd, 2, 8.0 Hz). Two singlet aromatic protons indicated this signal have para position (B ring), appear at δH 6.42 (H-8, s) and 7.55 (H-5, s). 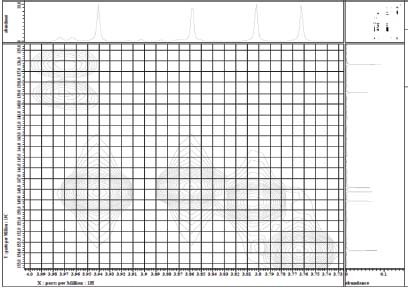 The other signals indicated the presence of ring A : 2 methyls (d) were shown at δ 0.98 (2-Me, d, 7.0 Hz) and 1.12 (3-Me, d, 7.0 Hz). The presence of two methine at δ 2.77 (sixtet) and 2.41 (sixtet) with 7.1 Hz constants J coupling, indicated this signals have cis orientation. Two singlet aromatic protons at δ 6.42 (H-8, s) and 7.55 (H-5, s), indicated this signal have para position in the ring B. 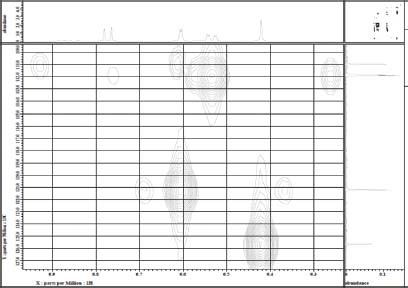 Two signal methoxy (-OCH3) were showed at δ 3.76 (6-OMe, s) and 3.86 (7-OMe, s). 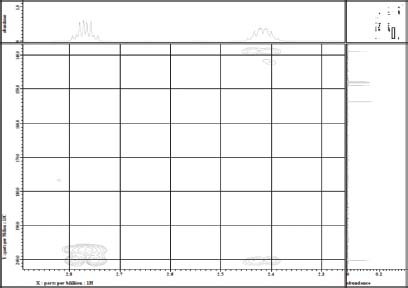 That were ilustrated in partial structure A, B and C, was shown in Figure 2. 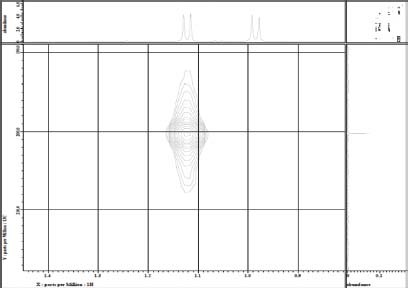 The 13C-NMR (Figure S6-S9) and HMQC spectrum (Figure S10) also supported the presence of A, B and C, with the presence of ring C signals at δ 111.8 (C-2'), 110.9 (C-5') and 121.2 (C-6'). 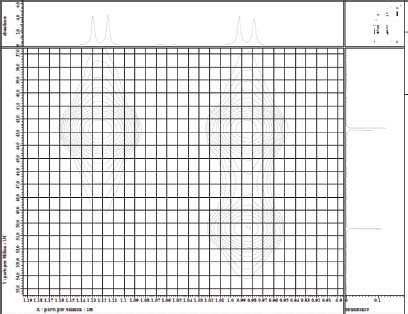 Signals at δ 200.2 (C-1), 42.8 (C-2), 42.6 (C-3,), 16.11 (2-Me) and 12.10 (3-Me) support for the presence of ring A, and signals at 111.9 (C-8), 108.2 (C-5), 56.0 (6-OMe) and 56.1 (7-OMe) confirm for the presence of ring B. 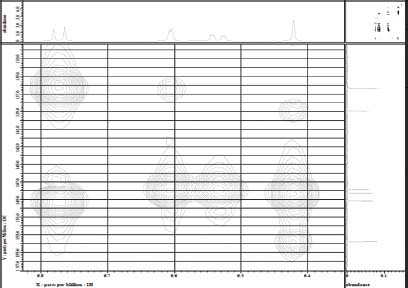 Base on this spectral data, indicated that the structure is alkaloid. The compound 1 also showed alkaloid spot which was visualized by Dragendorf’s spray method in aluminum sheet. 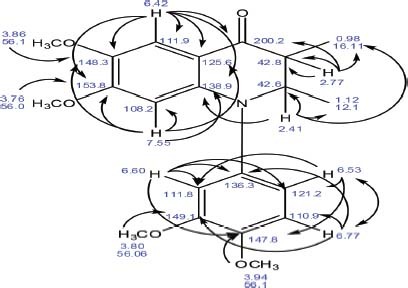 For construct this partial structure was elucidated by use HMBC (Figure S11-S21). The presence of long range coupling in the HMBC experiment between C-2 (δ, 42.6, d) and H-3 at δ 4.41 (d) and C-10 (δ 133.84, s), C-2 (δ 46.04, d) indicated ring B was connected with ring A at C-9 and C-10. 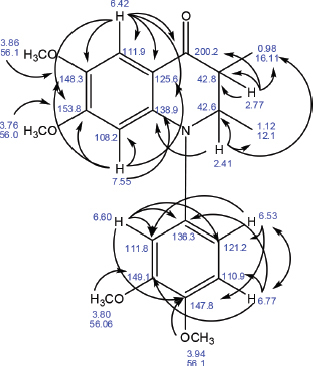 For construct this partial structure was elucidated by use HMBC experiments (Figure S22). Compound 2 was obtained white crystal, m.p. 102-104°C, molecular formula C20H22N2O4. 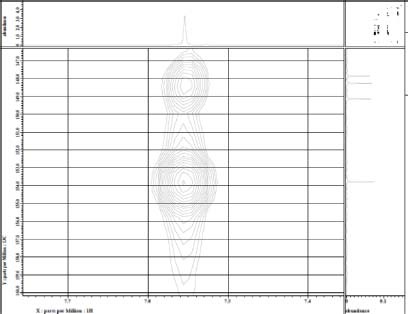 1H-NMR (CDCl3, δ): 6.88 (s, CH-1), 7.07 (s, CH-3), 6.99 (s, CH-10), 3,86 (s, OCH3-2), 1.08 (m, CH3-5), 3.88 (s, OCH3-6), 3.89 (s, OCH3-7), 3.9 (s, OCH3-8), 0.67 (m, CH3-9) (Figure S23). 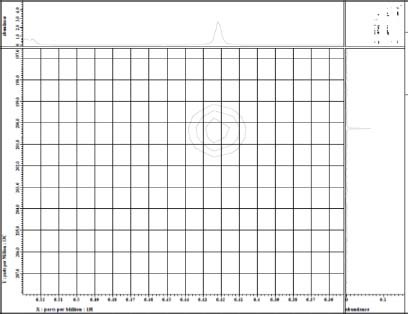 13C-NMR (CDCl3, δ): 118.51 (C-1), 148.99 (C-2), 110.38 (C-3), 147.90 (C-3a), 135,69 (C-3b), 147.78 (C-4a), 133.48 (C-5), 148.60 (C-6), 148,96 (C-7), 148,64 (C-8), 134.84 (C-8a), 133.26 (C-8b), 133.82 (C-9), 109.35 (C-10), 55.88 (OCH3-2), 11.89 (CH3-5), 55.87 (OCH3-6), 55.95 (OCH3-7), 55.90 (OCH3-8), 15.05 (CH3-9) (Figure S24). 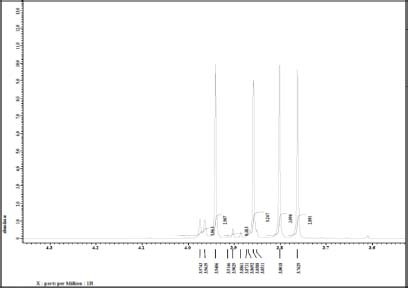 Compound 1 and 2 were considered as good antioxidant agent with IC50 value 6.42 and 11.80 μg/mL respectively which is compared to boldine as alkaloid standard with IC50 5.80 μg/mL by DPPH methode and by reducing power assay for 1 and 2 with IC50 value 7.02 and 13.74 μg/mL respectively which is compared to boldine with IC50 5.95 μg/mL. Table 1. 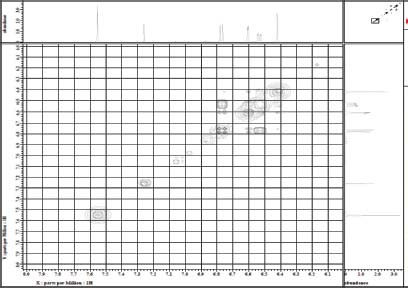 Based on the result of Table 2 shows that compound 1 and 2 non-cytotoxic because IC50 value is very high. 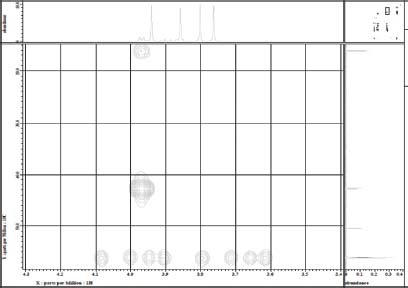 Compound (1) and (2) exhibited antioxidant activity with IC50 6.42 and 11.80 δg/mL by DPPH and by reducing power assay method with IC50 7.02 and 13.74 δg/mL recpectively. Both compounds are non-cytotoxic because IC50 value is very high (above the NCI reference). Conflicts of interest CONFLICT OF INTEREST The author declare there is no conflict interest in this research. Dr. Rosmalena Sofyan, M.Biomed. Senior Lecturer at Faculty of Medicine, University of Indonesia. Specialization:Biochemistry, Biomedical Science, Molecular Biology.